Hello everybody hope this article finds you well. One of the biggest events of the year is upon us, the Mosconi Cup, which is an action packed team event. In lieu of this I figured I would write an article about some of the do's and dont's of team play. Some of the "dont's" will be obvious but my goal here is to explain why and to add some suggestions for positive reinforcement during team play. I have had several occasions to play under highly competitive team circumstances. I have won the team division at the BCA and VNEA Championships in Las Vegas, played in the World Team Championships and was a member of the Toronto Blue Sharks Bonus Ball team. I would say the toughest of these experiences was Bonus Ball not only because the game was harder but also because the shot clock was so short. In this format players were allowed to coach other players at any time during a match, even during a singles match when they were sitting on the sidelines. If I had the choice I would want unlimited coaching because another player might see something that you don't but in this case with the short shot clock it made things quite interesting. I would like our readers to be careful when giving advice though, particularly to a lower level player. In the APA you are allowed one captain's timeout per game, one major mistake that I have seen in these spots is that the captain is giving advice that the other player cannot execute. For example, telling a player to draw a ball 9 feet when they can only draw a ball 3 feet. That is a bit of an extreme example but the idea is that your player must have confidence in the shot they will be shooting. If you see them hesitating on your suggestion, try offering another suggestion that they feel comfortable with. Another obvious mistake that can be made in team play is making your opponent feel bad about making an error. I know the large majority of us are aware enough that this is a major mistake but we have to be careful even about implicit things like body language when one of our teammates make an error. One good strategy for this I think is to actually make an excuse for your player. For example saying something like "I know that shot was too straight to get the position you wanted and that's what made you miss", or "you got unlucky when you tried to break out that ball and it made things tough for you from there". The fact is that when your teammates make a mistake they feel bad not only for themselves but for you as well and when you show a bit of understanding to them it will help keep them in a positive mind frame. Coming back to the Bonus Ball, different styles of team play were all on display throughout the first season. There was teams like the Phoenix Fire who had a dictator-like style with Scott Frost as the captain directing most of the shots. You had the New York Pride who were more of a team of individuals but at the same time were so talented that they were very successful. My team was interesting because we have all been friends off the table for over ten years so we felt very comfortable. But I believe some times that level of comfort gave us some problems on the coaching end of things because we felt like we could just say anything to each other. One of the most powerful things in team play is to develop good team unity and morale, something I feel the Europeans have done better than the Americans in recent years at the Mosconi Cup. Don't be afraid to congratulate your teammates with a high five or a pat on the back when they win a game, with respect to your opponents of course. I have seen it written before that one of the greatest highs in life is winning or getting something accomplished as a team and it is something that we all seek out. Stay tuned to cuesportnation.com in the upcoming week for all the updates from the 2014 Mosconi Cup. It will be an interesting event this year, as the U.S. has brought in some new blood along with veterans Corey Deuel and Shane Vaa Boening in an attempt to switch the fortunes that they have had in recent years. Hey everybody, I hope the beginning of the 2014 pool season has been treating you well. As all pool players know, and as is similar with life in general, everything goes in cycles. In pool sometimes it feels like you can do no wrong and sometimes it feels like you are struggling to do anything right. Today we are going to look at some of the ways to develop consistency and learn how to try to better deal with the ups and downs in your game. Personally I have been in a bit of a slump lately. After two close losses at the U.S. Open in mid October I have played a couple of tournaments in Ontario where I felt like I was a pretty big favourite and had some disappointing finishes, not finishing in the top 4 in either event. This had made me think a lot lately about numerous aspects that will help me get back on track. There are so many factors that go into winning or losing a tournament. It is almost without fail that when we do well or win a tournament we can look back at one or two instances where we could have lost, and as fate would have it the pool gods were looking upon us. Not by any means taking away from what Shane Van Boening did to accomplish his 3 peat at the U.S. Open this year, but let's not forget that he won 3 matches hill-hill along his path to victory. That being said it is uncanny how often top players will come ahead with a hill hill victory, rather than be put to the sidelines with another story of a match that almost was. You can see the same thing happening in tennis when the best players go to a tiebreak, they just seem to have that x factor that brings them through in crucial times. So the question is how do we develop the traits of a consistent winner? People will have many ways to deal with these factors but I can tell you that one foolproof way that will make you stronger in these areas is to put yourself in the mix of having to overcome them. The more often you play good players, the less intimidated you will be by them. The more times you play for big prize money, the less you will be affected by it. People deal with losing in many ways and the fact is that no one likes to lose. I think the most positive thing we can take from losing is that it gives us a chance to evaluate our weaknesses. On the day we unfortunately make these mistakes it causes us to have a negative result, but in the long run we can draw on them to make an overall improvement in our consistency. As long as you have prepared properly and have given 100 percent effort you should never feel bad about losing. At the same time try to be aware of the different factors that made that preparation break down. I hope this helps and hopefully you will be doing more winning than losing throughout the next year. One of the most overlooked skills in pool is jumping. In reality it is a very big skill; being a strong jumper means that you will give up less ball in hands and jumping at a ball and pocketing it can change the complexion of a whole match. Some of you might remember Shane Van Boening's creative jump in the final of the U.S. Open this year where he wasn't able to reach the shot, so he used a stacked bridge method to jump the ball. I have seen Alex Pagulayan do this on one other occasion but admittedly I have never attempted it myself. Here is the video for your interest (see below). For those that cannot see this video search "Shane Van Boeining 30,000$ Jump Shot" in Youtube. - When jumping the cue ball will be bouncing towards the object ball. When the cue ball is struck with draw it will spin backwards off of the object ball. The other effect when hitting high on the cue ball is that it will continue going forward and because it is bouncing it can tend to jump the rail and go off the table. -Jumping with draw will also cause the cue ball to bounce less as it is travelling towards the object ball, this will give you a better chance of hitting the proper contact point on the object ball. -Thirdly, this concept is hard to explain but from my experience the ball seems to jump easier when you strike the cue ball below center. Something that is very hard to accomplish when jumping is being able to look at the object ball last, instead of the cue ball. I once asked the strongest jumper that I have ever seen what made him so good and he said that he looks at the object ball last instead of the cue ball. However this is a lot harder to do than you think because the elevation of the shot will make you want to look at the cue ball rather than the object ball. If you do look at the object ball last you have to trust that your stroke will be dead straight as well because catching any side spin on the cue ball will alter the path of shot a great deal. If this is something that you have never tried I would give it a shot but I will reiterate that it is actually very hard to do, it is my belief that most pros look at the cue ball last when jumping. An underrated option when jumping is jumping to play safe. Percentage wise only the best jumpers in the world can be considered a favourite to jump in balls that are already tough to pot without the added difficulty of jumping. When you play safe the contact point of the shot becomes much bigger, this is something that I do on a regular basis. Pushing out to jump shots is also something that is often overlooked. There are three main styles of jumping, there is the "dart style" which some people say jumps the ball easier, personally I find it hard to get power with this method. For people that are shorter or people that have a hard time getting their body into a position that they can elevate this can be a successful method. Secondly there is a method where you bring your forearm to a side arm position. This also works well for people that have a hard time elevating. Shane Van Boening uses this method and I find him to be a very strong jumper. Lastly and this is the method that i would recommend, you can simply elevate the cue in a normal shooting position. The key to executing this properly is to have enough flexibility in your shoulder to be able to achieve the proper elevation. There are many factors that have to come together to be a strong jumper and the fact it that it takes a lot of feel and the best way to develop that is hard practice and repetition. I will be releasing my first instructional commentary series very soon, the idea will be to comment on pro matches adding a visual learning component to our instructional material. Hello again everybody, I hope everything has been well with you and hope that you have had a good start to your 2014-2015 pool season. For our instructional today we are going to talk about the importance of using follow as opposed to draw when both options present themselves. This is a topic that comes up regularly when I am instructing. The basis behind the theory is that draw is affected a great deal more by speed than follow is. Also, the distance between the two balls will make you have to judge how low and how hard to hit the ball. Thirdly the cut angle of the ball dictates how much draw and speed you will have to use when executing the shot. The problem with these three things is that they all require feel, which no matter how accomplished you are can be misjudged. When following a ball the most important thing to know is the natural angle that the cue ball will take after potting the ball. You must remember that the higher the speed that the cue ball is struck at, the higher you must go on the cue ball to hold that natural angle. For example at a low speed the cue ball can be struck a little above center and it will still follow the natural angle but at a higher speed it will stun follow at that same contact point. It is a challenge to learn all the natural angles but when you do it becomes easier than relying on the feel involved with using draw. The natural angle does not vary with the distance between the object ball and the cue ball so this is another advantage to using draw. A very common case where using follow instead of draw arises is when you can change the path of the cue ball with follow and spin (usually outside english) and obtain the same result as if you were to draw the ball. This case would usually arise when you could use soft draw to end up at the same point as using follow and outside. Soft draw is the toughest draw shot to judge so try and look for these spots and you will see an improvement in your game. The main thing when choosing to draw a ball is to determine if using draw will make the cue ball travel less. If this is the case then draw could be the right choice for the shot but if the cue ball is moving the same distance or close to the same distance when following, then follow is usually the right shot. As a side note I would like to add that when shooting the last shot like the 9 ball or the 8 ball, you should almost always use a medium stroke with draw causing a stop shot. This allows you to hit the ball more confidently and on the last shot, position is not important so the other factors involved with using draw are not relevant. Thanks for your time and I hope this helps. I will be off to the US Open next week and will be writing daily updates so stay tuned. Hello again everybody, pool season is right around the corner and its time to put away the golf clubs and dust off the cues for another action packed year on the felt. Today I am going to discuss something that I believe is the most important aspect of fundamentals, it is one of the first things I look at when I am assessing a new student. This aspect of fundamentals is backstroke pace. This fundamental in my opinion is the most overlooked and the most common flaw amongst amateur players. Try to visualize for a second in comparison to other sports that are stroke related. In golf you bring the club back slow and then accelerate towards the golf ball. In tennis you bring the racket back slow and then accelerate towards the tennis ball, in archery the string of the bow is loaded up slowly then the natural physics of the bow allow the arrow to accelerate until it is released. It is amazing to me how few players apply these concepts from other popular sports into pool. #1 You will not be in control of the line of your back stroke and twisting through the stroke will be a lot more common. #2 Try to visualize this, to hit the cue ball purely the forward stroke must be accelerating towards the cue ball. If your backstroke is too fast you will not always be able to accelerate at the cue ball because it will force you to over hit the cue ball. This subconscious knowledge of over hitting the ball will also cause you to decelerate towards the cue ball which is a major mistake. #3 Improper acceleration which again is a flaw that derives from a rushed backstroke will also cause you to follow through the cue ball less. Following through properly is imperatively important for advanced level shots like power draws and power follows. Some instructors will say that the backstroke pace should always be the same, I do not necessarily disagree with this but it is my personal belief that your backstroke should be the slowest when hitting pocket weight shots, should be at a medium pace when hitting medium speed shots and at a faster pace when hitting power shots. In each case the backstroke speed should be slightly slower than the forward stroke speed, ensuring that you will be accelerating towards the ball. Some pros that have beautiful backstroke pace in my opinion are Shane Van Boening, Earl Strickland, and John Morra. In snooker almost all players play with a slow backstroke and I believe the one that executes it the best is Ronnie O'Sullivan. In pool you also have players like Dennis Hatch, Alex Pagulayan and Johhny Archer that have shorter backstroke and those players tend to bring the cue back faster. But the key is they still bring it back with good pace and are still accelerating towards the ball. If this is something that you have never considered give it a try next time you get to a table and I guarantee you will notice the difference. Take care and keep shooting straight. Good day everybody, hope you are all doing well. This weekend I was in Ottawa for an 8 man bar table event. 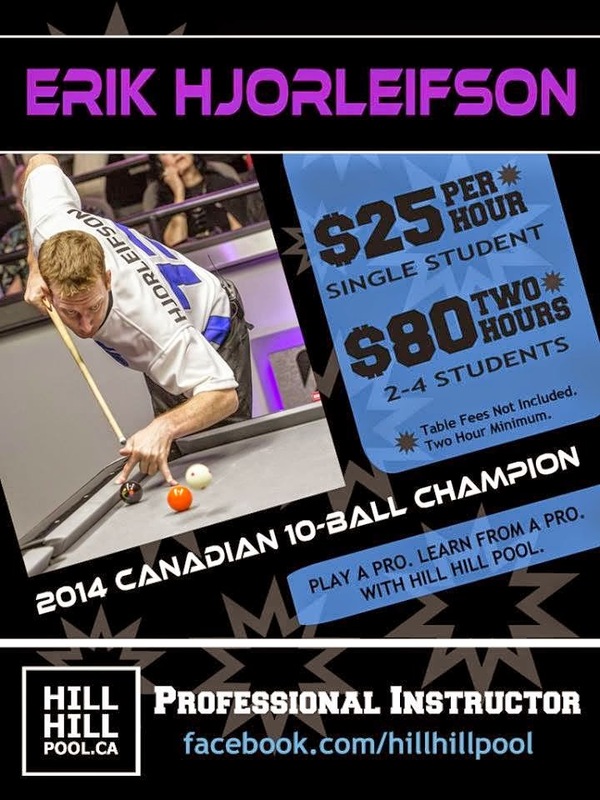 Although I haven’t played much in the last 10 years, as most of the events in the Toronto are nine foot 9 ball events, I do have a fair bit of experience playing bar table 8 ball in Western Canada and the Northern Midwest dating back to when I grew up in Winnipeg, Manitoba. For this week’s article I thought I would write about some of my views and strategies of playing 8 ball on the small tables. As with many pool games the most important shot is the break. In 8 ball the break is particularly important because if you pocket a ball, you will have the choice of any of the remaining balls on the table to begin your run with. Where as in 9 ball or 10 ball you only have one ball to shoot after the break. When I was younger I played a lot of competitive 8 ball with players like Shane Van Boening, Jesse Bowman, James Baraks, Chad Vilmont, Rory Hendrickson among many other good players from Western Canada and Minnesota. At that time I can tell you that at least half of the top players were using the second ball break. Personally I have been more attracted to the head ball break, but have won tournaments with both. In any break you are looking to execute one that will pocket the same balls consistently. For the second ball break you are looking to pocket the balls in the very corner positions of the rack directly, in either of the bottom corner pockets. If you are not pocketing these balls consistently I would tend to move away from this break. It can be a very effective break but in general your chances of fluking a ball other than the two corners balls is lower than when breaking from the middle of the table. In preparation for the tournament this weekend in Ottawa I practiced breaking from the middle and also a little bit on the second ball and found I had more success from the middle. I was talking to a knowledgeable friend of mine who had recently been in Vegas for the B.C.A.P.L and he tried to convince me that the top players were breaking second ball. I was skeptical so I went online and searched the 2014 U.S bar table 8 ball championships to see where the best players were breaking from. After watching Skyler Woodward, Shane Van Boening , Thorsten Hohmann and Jayson Shaw all breaking head ball from the middle of the table, I figured that was enough evidence for me and decided to go with and stay with the head ball break this weekend. The one thing I did notice that was different was the way that they were breaking from the back rail instead of breaking closed bridge from the head-string. I’ve seen some good players do this lately playing bar table 10 ball, but this was the first time I saw it playing bar table 8 ball. My feeling is that they are doing this because they were playing on a diamond table using the magic rack and felt like the balls behind the one were wired straight back in the side. It is easier to execute a break from the back rail than a break with a closed bridge from the bed of the table but I feel like you can’t hit the balls as hard from the back rail. Under the the conditions at the U.S. bar table championships the top players chose to use a more controlled break rather than hitting the break harder and relying on fluking a ball. This weekend in Ottawa the conditions were valley tables and the format was rack your own. Every player in the 8 man invitational tournament chose to break head ball. John Morra chose to break from the back rail and I chose to break with a closed bridge from the head string. I would say the main difference in my two victories against John this weekend was that I made more balls on the break. I definitely understand the merit of breaking from the back rail under certain conditions but it is still my belief that on a valley table or even a diamond table without a magic rack, breaking for power rather than control is more beneficial. I will cover these points in more depth in future articles, thank you every body and stay tuned as we are looking forward to the launch of our website platform cuesportnation.com in the very near future. One of the most frustrating things about playing pool, particularly 9 ball and 10 ball, is dealing with the luck factor that goes along with playing the game. It must be said that games like straight pool, 8 ball, one pocket and banks have considerably less luck than rotation based games. The main things that contribute to this factor are that both players are only attempting to pocket one ball, and the chances of inadvertently landing safe are much higher than in other games. 8 ball is the only other game that involves an open break, which also lends to the luck factor but in 8 ball you will almost always be guaranteed a shot off the break. The following are some realities that can seem negative but are not always as uncontrollable as they seem, and if understood can contribute to an overall better positive mental attitude. This is most often seen after your opponent has missed a ball and not left it in the open, or when returning to the table after your opponent kicks at a ball and leaves it back in a detrimental position. The fact about these instances, and something that I think about regularly is that at the time you are preparing to kick at the ball, your opponent only has a temporaryadvantage in the game. They do not yet have the offensive advantage. There is still an option for you to play a kick safe at the ball and there is still an option for you to get fortunate in return, thus shifting the temporary advantage back to you. In other words the mindset you have to have is that your opponent did not get lucky until the outcome of your shot has been determined. I challenge all of our readers to properly rationalize the cause of the times when your opponent explicitly gets a roll. Consider this, if you scratch on the break and your opponent misses a ball 5 shots later and flukes it, in fact your error allowed that luck to happen. If your opponent flukes a hook and you entirely miss the kick, then you have contributed to your opponents luck. Remember that in 9 ball and 10 ball your percentages of receiving a shot will increase dramatically relative to how close the cue ball ends up to the middle of the table. Making a ball on the break is very related to how good the rack is and how the break is executed, so make sure you consider these things when breaking. At the highest level try to develop breaks where you are controlling the 1 ball to give yourself the best percentage of landing on it. The easiest way to avoid luck in pool is to break and run a rack. If you are at the level where you can break and run racks, maintain a focus on this because this is the only way you can really guarantee a win in 8 ball, 9 ball and 10 ball. If you're not a the level where you can consistently break and run racks, accept the fact that there will be an element of luck in your games and think about some of the strategies I have outlined to help you stay in an overall even state of mind. Try your best to focus on your own game and creating your own luck instead of focusing on what your opponent is doing. This of course is all easier said than done as with most things in life, but I can tell you that when I am playing my best I don't even consider the luck factor because I take responsibility for my errors and always give myself every chance of turning fortunate rolls back on to opponent . Thanks everybody, I hope this helps.